Straight on left side view of Dale “Sugarstump” Price’s Stock class Sterling. Photo courtesy Dale Price. 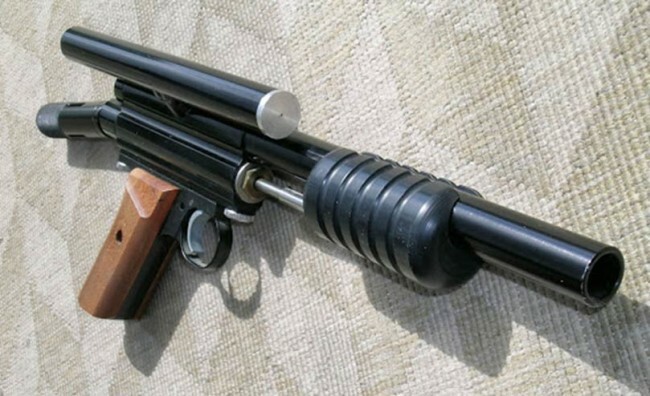 During the resurgence of stock class in the early to mid 90s, G&H Sterling / Proline released a few bodies that were configured for loading 10 round tubes. I would place the year on these as 1994-96. Right side view of Stock Class Sterling. Photo courtesy Dale Price. Additional top view of Dale “Sugarstump” Price’s convertible rock back or rock forward nelson. Photo courtesy Dale Price. Right side view of Dale “Sugarstump” Price’s convertible stock class Sterling. Photo courtesy Dale Price. Left side view of Fernando Castillo’s Stock Class Sterling body. Notice ball detent hole drilled. Dale’s stock class Sterling looked similar to another I came across ten or so years back, but there are slightly differences. 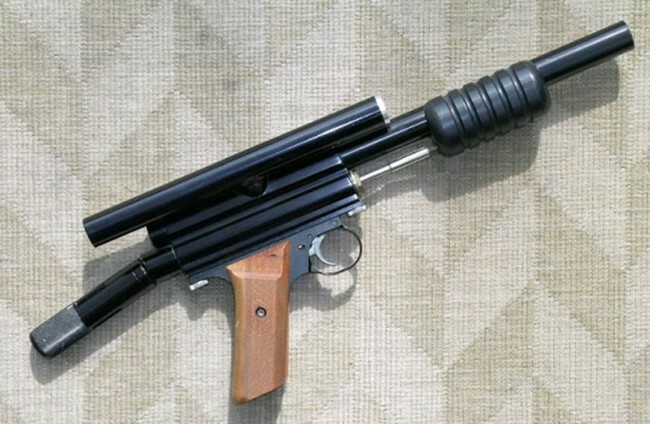 Back in 2005, Fernando Castillo, who worked at Carter Machine in the early to mid 1990s, sold a few of his paintguns on mcarterbrown.com. I’ve posted photos of several paintguns that I picked up from Fernando including a Carter Machine milled early SterIing, a Vindicator that’s actually for sale on the site, and a nice early Buzzard. Top view of Fernando Castillo’s Stock Class Sterling body. Front view of Fernando Castillo’s Stock Class Sterling body. 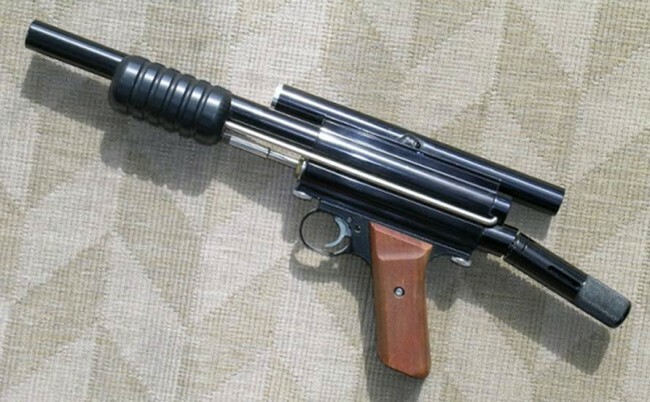 But one of Castillo’s paintguns I purchased I forgot about until I saw Dale’s photos. This was a Stock Class Sterling body, very similar to Dales, that came with Fernando’s Carter milled Sterling. I wasn’t sure if this was a factory direct feed body, or a sterling that Fernando pulled the feed out of and added a stock feed onto. But looking at Dale’s example, the feed neck welds are very similar. 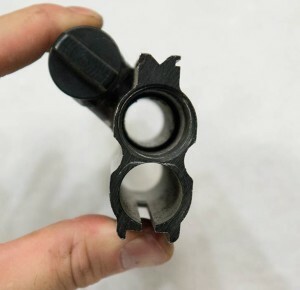 The main difference between Dale’s factory stock class Sterling and Fernando’s body was that Dale’s can be set up for rock back (Sheridan style) or rock forward (Nelson style) and Fernando’s was rock forward only. Fernando had also cut a powerfeed hole straight through the feedneck that shows the balls and used an automag or spyder plug instead of Dale’s stock aluminum plug. Right side view of Fernando Castillo’s Stock Class Sterling body. Notice drilled ball hole and possible raw around where powerfeed plug meets the body. I sent these photos to Dale on April 29th, 2015, asking what he though. Front right view of stock class sterling. Photo courtesy Dale Price. Aside from Fernando’s drilled feed view hole and ball detent, I hadn’t noticed any other modifications on this body, but after rereading Dale’s comment I started thinking a little more about it. I don’t have this Sterling in front of me, so I can’t verify it for another several months, but I think Dale (if he even meant it) is right. I think the front portion of the feed is sliced off, converting this body from a rock back/rock forward to a rock forward only body. G and H Sterling Patch. c. early 1990s. 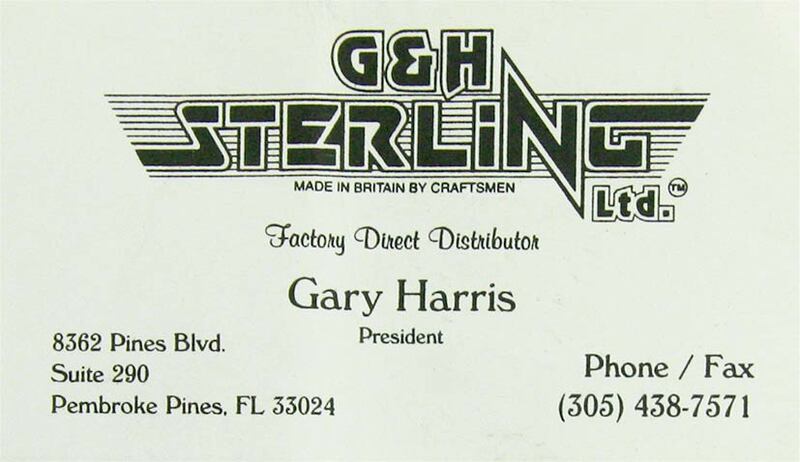 Gary Harris’ G & H Sterling business card from the early 1990s. I’m not totally sure on the company names that Dave Galsworthy sold the Sterlings under throughout the 1990s and the progression between the different company names but I’ve included a business card for Florida Bushmaster Captain, Gary Harris, which dates from probably the early to mid 1990s as well as a G&H Stering patch. Harris was the importer for Sterlings for a while but I’m not sure when he stopped. These two pieces of memorabilia came with a busted Sterling I bought a couple years back. Thanks as always to Dale “Sugarstump” Price for letting me repost his photos. Ant Linda blast paintballs through a Team Dragoon Carter Machine Buzzard pump paintball gun from the late 90s originally owned by Dragoon player Mike Jacot. A look at Lapco Stock Class Ghost number 32, built by Colin Thompson in the early 1990s while he was employed at Mr. Paintball in Escondido. Episode 5 of PBDA (Paul, Benji, Dan and Andre) where we talk about vintage autocockers, listen to Benji's Paintball Rap, and wear sock hats!